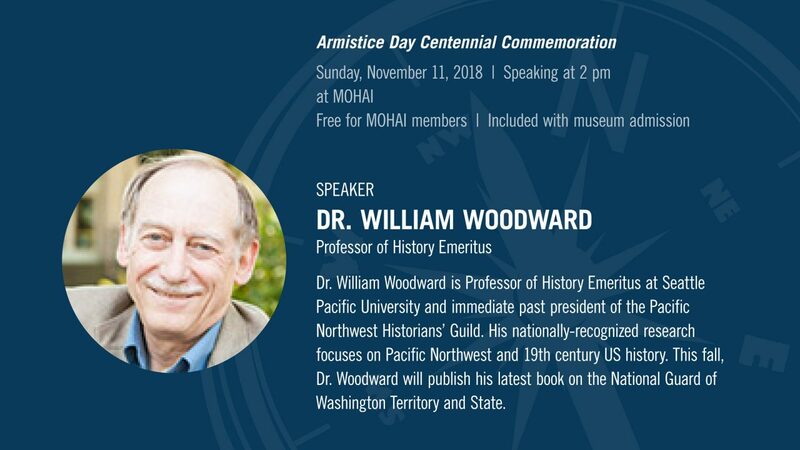 Join us for a wreath-laying ceremony honoring the Armistice Day centennial with special guests Rear Admiral William Center, King County Councilmember Rod Dembowski, MOHAI Board of Trustees President Maureen Frisch, and representatives from the Consulates of Austria, Canada, Finland, Germany, Hungary, Lithuania, Turkey, the United Kingdom, and others. The historic Great Seattle Fire bell will ring alongside Bells of Peace across the nation, honoring the sacrifices made at home and abroad to secure a lasting peace. Musical accompaniment and a presentation and posting of colors will be performed by singer Jose Iniguez, a brass quintet, and the Civil Air Patrol Youth Corps. Celebrate the 100th anniversary of the declaration of peace with a day full of music, activities, learning, and special events. Try your hand at poppy-making while enjoying the sounds of an authentic World War I-era player piano courtesy of the Pacific Can-Am Chapter of AMICA, the Automatic Musical Instruments Collectors’ Association. Learn how the Veterans Conservation Corp is supporting veterans, past and present, and join with thousands around the world as we host the museum’s first Peace Pole. 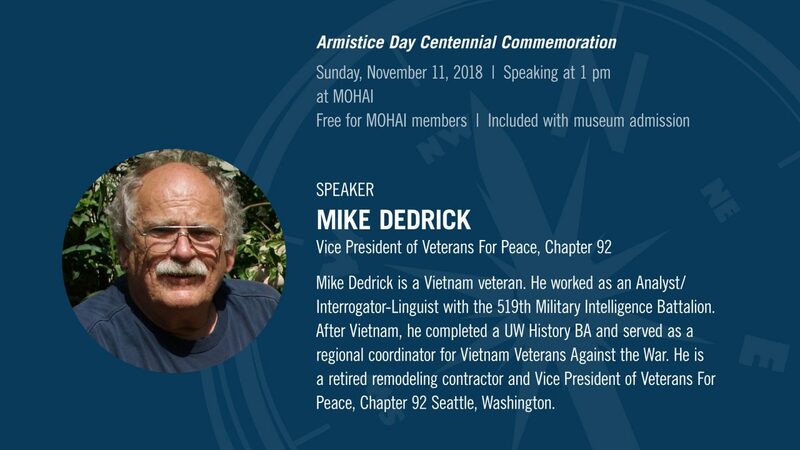 Mike Dedrick, Board of Directors Vice President of Veterans for Peace, Chapter 92, will be on hand to discuss the history of WWI and US involvement. 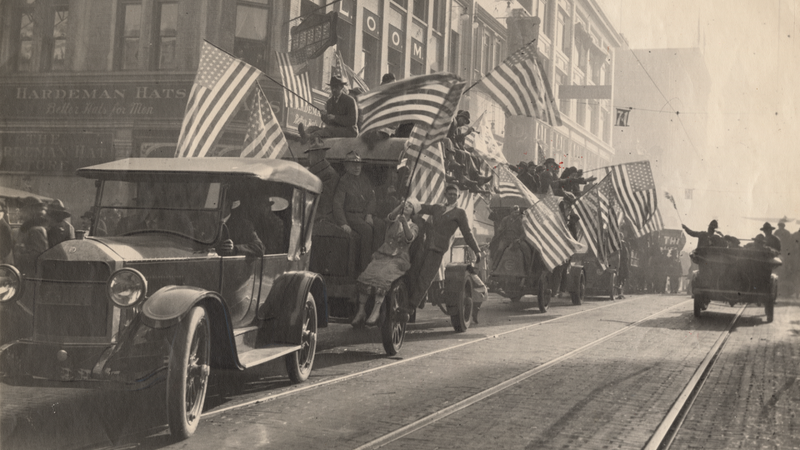 From the Treaty of Versailles to the US congressional declaration of Armistice Day, learn more about the history of the Great War. Historian William Woodward shares historical insights regarding the Lost Peace–the failure, despite Woodrow Wilson’s grand vision, to create a structure for preventing international rivalries from degenerating into another world war.